Yes! 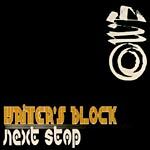 The second album from Writer's Block (Visionaries' Dannu and Lord Zen), Next Stop, has been unleashed! Pick this up with swiftness. This sophomore album is self-released and limited! Features the production talents of Life Rexall (Shapeshifters), DJ Babu, Key Kool, Mr. Brady, Nobody, Profile, Omid, Brees, Da Fallguy, and Elon.is. Don't miss out this time! Neeeeext Stoooooooooooop!